For the first time ever, UCF engineers will be joined by students from nine Florida universities for a display of 150 innovative STEM projects. 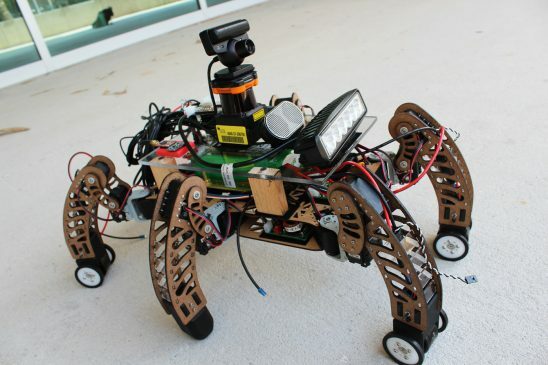 During the Spring 2018 Senior Design Showcase, "SigSent," a six-legged surveillance robot, will display its ability to walk on rough terrain and roll on smooth surfaces. From an augmented reality restaurant menu that could change the way we order food to proposed solar sculptures for Orlando City Stadium, 600 UCF engineering and computer science students will display 125 innovative projects Thursday during the Spring 2018 Senior Design Showcase. The projects, which will be on display from 10 a.m. to 3 p.m. in the Harris Engineering Center and Engineering Building II, is a culmination of eight-months of effort that students must complete for their capstone senior design course. Engineering and computer science students take Senior Design I to brainstorm and design a project before bringing them to life in Senior Design II the following semester. This year’s showing will have even more to offer, as students from nine other engineering colleges present 25 additional projects for the first Florida-Wide Student Engineering Design Invitational. Orlando Utilities Commission is one industry sponsor that challenged three teams to design a solar-powered art sculpture for the downtown Orlando City Stadium. The three solar sculptures include “Giration,” a soccer ball with filigree shadows; “¡Golazo!,” a soccer player kicking upwards into a net; and “Project Impact,” a bursting soccer ball and three risers. Another project on display is the “Noni” augmented-reality restaurant menu that provides an authentic view of the food selection and is already being used at local restaurants. The demo will allow users to choose a supported restaurant, point it at the table and experience the food as if it were actually there. There will also be a real-life transformer in the form of a six-legged surveillance robot, known as “SigSent.” The droid will demonstrate the intelligence to tell the difference between rough and smooth terrain and adapt between walking and rolling on each appropriate surface. The showcase will close with an award ceremony in the Engineering II Atrium from 3:30 to 5 p.m. A volunteer panel of faculty, staff and engineering professionals will vote to determine the top projects in each discipline, the top visiting project, and best-in-show. I was amazed how well each table demonstrated their senior design project. All of the team members were excited and proud to describe their team design with the final outcome. You could feel the energy walking around UCF Engineering campus. These students are our future and I felt honored to be with them. Congratulations and best wishes to our incredible Florida Engineering students and to the winning showcase design team, Florida Institute of Technology.